You just ate your favorite dinner. After relaxing for a few minutes, you decide it's time to brush your teeth. You head into the bathroom, open up the medicine cabinet, and pull out ... a tree twig? If you're living in ancient Babylonia or Egypt, chances are that's just how you're brushing your teeth. Can you imagine?! How about brushing your teeth with a utensil fashioned out of animal bone and hog hair for bristles? You're probably thinking how lucky you are right now that you live in modern times. Today, most people brush their teeth using either a conventional manual toothbrush or an electric toothbrush. Just how did the toothbrush evolve over the years, and when did people start using toothbrushes with electronic parts to clean their teeth? And how do electric toothbrushes work? The first known bristle toothbrush that looked like toothbrushes used today dates back in recorded history to the Tang Dynasty, circa 700 AD. This toothbrush was created out of hog hairs used for the bristles, and the handle was made out of either animal bone or bamboo. The idea of the bristle toothbrush caught on years later in Europe and became more widespread in the 17th century. In 1690, English antiquarian (one who deals in antiquities) Anthony Wood wrote the first known use of the word 'toothbrush' in his autobiography. Toothbrushes made from hog or horse hairs continued to be mass produced up through the mid 20th century. In 1880, an English doctor known as Dr. Scott advertised the first electric toothbrush. The funny thing about this electric toothbrush was ... it used no electricity whatsoever! In fact, Dr. Scott also advertised electric hair brushes and even something he called an 'electric flesh brush,' and none of these devices used electricity either. Scott's electric toothbrush actually had slightly magnetized iron rods in their handles, and there was no electrical current at all. Though the first electric toothbrush was invented in the 1930s in Switzerland, it was quickly taken off the market for ineffectiveness. The first effective electric toothbrush, known as the 'Broxodent,' was then invented in 1954 by Dr. Philippe-G. Woog. The toothbrush was marketed first in Switzerland and later introduced to the U.S. at the 100th anniversary of the American Dental Association in 1960. Electric toothbrushes have an internal motor that begins to spin when the toothbrush is switched to the 'on' position. The gear inside converts this spinning into an upward/downward motion, and the brush moves as well. This motion, of course, mimics the brushing of teeth with a manual toothbrush. Electric toothbrushes can be extremely effective for cleaning teeth, especially for those with braces or painful hand and wrist conditions. An electric toothbrush works by vibrating and oscillating. The motion is usually caused by an electric charge produced by a small battery in the toothbrush. Some electric toothbrushes work by inductive charging, which is when two parts of a transformer inside the brush are brought together and a small magnetic field creates an electric current to charge the battery. Other electric toothbrushes are operated by replaceable or rechargeable batteries. The electronic components of the toothbrushes must be sealed to prevent water from coming in, which would damage the electronic parts and render the product unusable. Electric toothbrushes, because they must remain waterproof, are often charged through a charging unit containing electronic components that hold and control an electric charge by electronic component such as capacitors and resistors. Electric toothbrushes typically use pressure sensors as well as timer devices that are set typically at two minutes, which is the time the American Dental Association recommends is best for brushing. 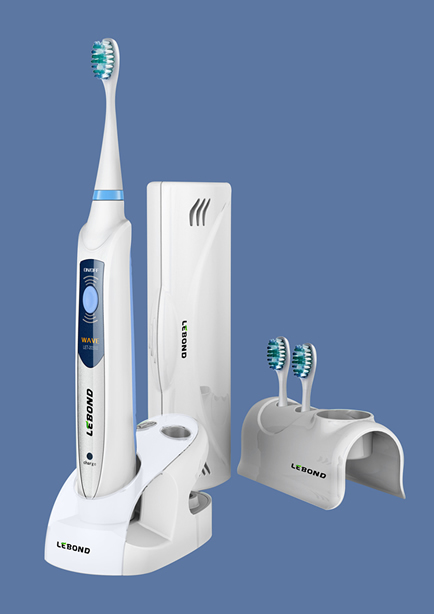 Electric toothbrushes essentially fall into one of two categories, with the type of action utilized deciding which category. The first type is 'vibration.' This type of toothbrush brushes with a technique like that used in manual, where brushing happens over many teeth at once. The second type is 'rotating-oscillating.' This category brushes in much the same way a dentist would brush a patient's teeth, using a technique that cleans slowly, from one tooth to the next. Perhaps no one needs to use an electric toothbrush ... but millions of people swear by them and wouldn't have it any other way. Because electric toothbrushes spin at many more times the rate that can be performed manually, their effectiveness for cleaning the teeth often can be greater than brushing with a conventional toothbrush.